Cochineal is among the most ancient and versatile natural dyes on the planet. It has excellent light and washfastness properties and produces a beautiful range of reds, scarlets, violets, fuchsias and purples. 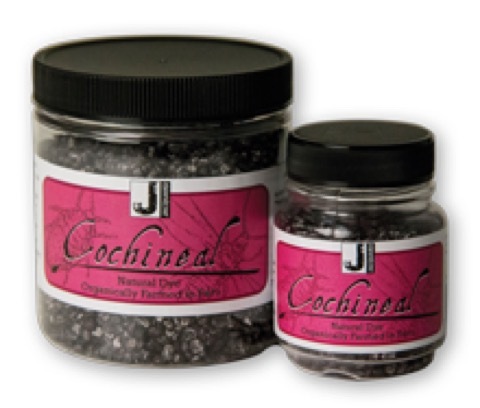 Permanent on all natural fibers, cochineal is often used with a mordant such as alum. The color (carminic acid) comes from the bodies of female insects of the species Dactylopius coccus. These parasitic insects are farmed on the prickly pear cactus (nopal), which is native to Mexico, Central and South America. Jacquard’s Cochineal comes directly from a small, family owned and operated, organic farm co-op in Lima, Peru.